Bosco Wong Angered on the Street, Niki Chow Has "No Eyes To See"
Since breaking up with Myolie Wu, Bosco Wong has been trying to forget the relationship and concentrated on his work. 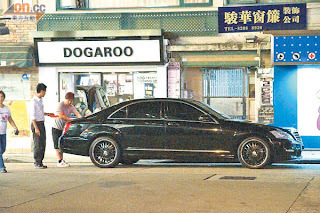 Last night, Bosco drove his Mercedes S350 and parked it on the street in Mongkok, where he went straight to work on TVB new series A Good Heart Goes Haywire. At the filming location, Bosco was shooting the scene with Niki Chow and attracted a lot of onlookers. The scene was about Niki, who became blind after an accident, walking down the street when a group of young guys surrounded her. Bosco was secretly protecting her and came flying out with a 'drop kick' to rescue Niki. Bosco showed off his waist strength when he did the drop kick and won applause from the surrounding audience. As for Niki, she was totally into character, acting just like a real blind girl. The onlookers praised her good acting skills. During the interview, Bosco was asked if there were any sparks between him and Niki? He said: "We're just acting, but we are a pair in the series and we have kiss scenes. It's not too intense though." As for ex-lover Myolie Wu and Kate Tsui battling for TV Queen, asked who he supports? Bosco said: "Myolie! She has a good chance, she did very well in Ghetto Justice II. If she does win, I will congratulate her!" However, Bosco also said if Kate or any one else gets the award instead, he'll be happy for them as well, "They are all my friends, I'll be happy for them!" When speaking of his chances for the TV King title? He said: "Every year, I don't have much confidence, but this year the competitors are so strong." Niki expressed this is her first time playing a blind person, she thought it was quite special, "There so many things to play with in this series, challenges my acting skills!" When speaking of the kiss scenes with Bosco? She said: "We collaborate pleasantly and able to accommodate. We're friends, so there's no awkwardness!"